There have been a lot of questions lately about what kind of deals T-Mobile might have leading up to Black Friday, and today we got our answer. This Friday, November 16, T-Mobile will offer its Magenta Friday deals. Customers can get up to $750 off a new smartphone from companies like Apple, LG, OnePlus, and Samsung when they trade in an eligible device and add a new line of service. Apple devices eligible for this deal include the iPhone XR, iPhone 8, and iPhone 8 Plus, which are free with monthly bill credits when you add a line and trade in an eligible Apple device in good condition, like an iPhone X, iPhone 8 or 8 Plus, iPhone 7 or 7 Plus, and iPhone 6s or 6s Plus. Customers can also get up to $750 off an iPhone X, iPhone XS, or iPhone XS Max with this offer. As a reminder, T-Mobile is also offering a free REVVL 2 when you add a line. The REVVL 2 Plus is available for $0 down and $3.50 per month for 24 months when you add a line. T-Mobile’s got deals on smartwatches, too. Customers who buy a Samsung Galaxy Watch or Gear S3 can get a second one for half off via 24 monthly bill credits. T-Mo is also offering $200 off a second Apple Watch Series 3 or Apple Watch Series 4 via 24 monthly bill credits when you buy one. These deals will be available for a limited time. There look to be some nice offers here so long as you can add a line and have a device to trade-in, like getting a free OnePlus 6T or a big discount on a Galaxy Note 9. If you don’t want to add a line, though, it looks like you may have to wait to see what future deals T-Mobile might cook up. Now that T-Mobile’s Magenta Friday deals are official, what do you think of them? Will you be taking advantage of any of them? kind of confused; if i have the full five lines on a family account, i can just never do upgrades now? Upgrade is old terminology. You mean a discount to keep your service? No. You can still buy any device that T-Mobile offers at retail price and take advantage of any trade-in offers they have. Sure is. You can also buy great unlocked phones for a fraction of flagships. My Z3 Play was $349 and it’s the best phone I’ve used. It replaced my $200 G4 that I still sold for $80. how is upgrade “old” terminology? that’s one of the most asinine things i’ve ever read from a t-mo apologist. yes, i can’t “upgrade” my phone, as in, getting a newer/better one, without adding a line. and the max on my grandfathered plan is five phone lines and some amount of devices, which i don’t use..point me to a trade-in offer that didn’t have an aal requirement, and i’ll do it. until then i’ll be buying slightly-older flagships unlocked. You’re sounding asinine. An “upgrade” implies getting a new phone at a substantial discount in order to remain with your service provider for a set term. Otherwise you’re just buying a damn phone! 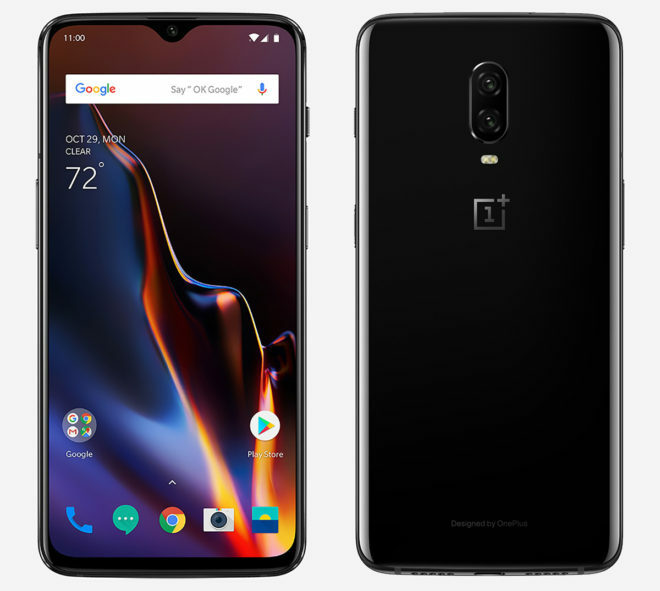 The OnePlus 6t trade-in offer was for anyone without a requirement to add a line. T-Mobile will ALWAYS take your phone back in on trade if you’re willing to take what they’re offering. I hope Costco mirrors the T-Mobile store deal. I’d much rather have a gift card instead of dealing with 3 years of credits. This is a terrible black friday deal. In 2016 they did not have add a line for their deals. THIS IS NOT A DEAL, IT IS A SHAKEDOWN. You have to add a line AND trade a device in? This might be okay for some but this is definitely not one of T-mobile’s best promotions. Especially since the trade in list isn’t as great as previous promotions. Crap – just like last year. TMo never gives a promo to existing loyal customers for Black Friday. Another bummer this year. Already have a line for every family member. Agreed. AAL and trade in required . Thumbs down. Sprint and Verizon have all kinds of upgrade only deals through Best Buy. I know they need new subs, but throw the existing customers a bone. The Z2 Force deal last year did not require a new line. This is possibly the worst Black Friday promo I’ve seen. Add a Line and Trade in a device is just ridiculous. I’ve been a Tmo customer for so, so many years and they offer their long-time customers NOTHING. What a total disappointment. $750 is not free. You have to add a new line and pay a monthly bill for said line and you have to trade in an older phone. This offer is worth zero to me, a long time customer who is otherwise pretty happy. Again, you guys, tmobile is offering an incentive to add a new person to your account in the form of a free premium device for them with eligible trade from their previous carrier (usually). The promotion is not geared towards people adding a ghost line that you don’t need or want for one of your existing lines to upgrade! For those who fit the criteria, it’s a great deal! $750 free? Lol, check your numbers again. My point: no other account you have gives out $750 for free, so why are you expecting TMO to? T-Mobile uses the word free to loosely. My point was it was not free and never was. I can get the same deal at Walmart as everybody else. I don’t have to be a new Walmart customer, or apply for their credit card(which you can only do once) to get the same black Friday deal as everybody else. It isn’t the same thing. Nor is Walmart requiring me to buy a subscription to get a Black Friday deal. Stop being so rude and thinking you are smart. Your comparison doesn’t apply. It is the same deal as everyone else. New customers create new lines to get deals… Existing customers create lines to get deals…..
People act like New Customers are treated like a priority. 90% of these deals require you to choose the deal or carrier freedom not both… So new customers have to make a difficult decision on what they want to do and most of the time they end up spending more money than existing customers for the same deals. That’s the point of the argument. it isn’t really that great of a deal because you have to have a new line. if you are needing a new line, then it works out. I would like to get a new phone, but I’m not paying nearly a grand for a phone on top of the monthly fee to have service. This whole system is just a cash cow. That’s why they can give so much stuff away. Walmart doesn’t have a suscribers model where it is important to keep the customers happy or they pay $70 a month to Target instead for the right to use their services. And Walmart does give stuff away. Most Walmarts give free cookies to kids in the bakery. My kids got a free cake on St Patrick’s day. I have 12 lines and 1 is not in use. NO discounts for current customers? I pushed off getting the 1+6T for possible Black Friday deals, but they offer 0 for current customers (without adding an unnecessary extra line?) Come On, Tmo. What the hell are you doing to us?? The same thing Walmart is doing for me for shopping there 10+ years, The same thing the local Grocery Store is doing for me for shopping there multiple times a month, The same thing the electric company is doing to me for being loyal after all these years. If you don’t like the deals you don’t like the deals and can go somewhere else…. I love tmobile but i hate and really hate that you cannot get advantage of promotion unless you add a line. I have 11 lines. I do not need anymore lines. So the promo isn’t for you. Are you stupid i know it is not for me read before you make comment. Did i not say that already or are you stupid enough to point out something i made it clear. What’s stupid is complaining about a promotion that you have no intention of taking advantage of. I want to take advantage of moron. Read. I have too many lines that i cannot add anymore. It is not that i do not want the promotion this promotion will not work since i cannot add any more line. get a brain. I’ve got 7 lines from where the 7th is idling as a back up phone… No need for an 8th for me. So $20/ month for 2 years and the value of my trade in. I’d end up paying less paying cash or EIP. And changing someone’s phone number besides. What a scam. Finally, for me, good bye Note 5 and welcome Samsung Note 9 …with bill credits, trade-in (Note 5) and add a line. Anyone know how much a new line will cost monthly? Looks like adding a line is an additional $20 per month. We have always bought phones at full price so not quiet sure how these promotions work out for the customer in the long run (knowing very well that no matter how T-Mobile is to its customers, they are still in the business to make money). Can someone please tell me if I am looking at this incorrectly? We currently have 2 lines with 6GB lines each and data carryover, which suits our needs, for $85 total per month after tax. If I get this promotion, I would have to upgrade to the T-MobileONE plan and add a line which puts me at $140 for three lines per month. Which is an increase of $55 per month and I will have to trade my factory unlcoked iPhone 6S (about $250 on eBay). We usually keep our phones for three years. Given these numbers, is it a safe assumption to just buy the phones at full price? TIA for the suggestions and recommendations. 55(increase) * 24(months) = 1320 + trade in value for device… And that’s for just one device…. So yes it’s safe to assume it would be better on your plan to stay on current plan and buy devices out right or on EIP. Thank you, thats what I was thinking also. You do not need to switch to TM One, the deal is good on ANY postpaid voice plans. Thank you, will contact TMobile and see what they say about the TM One plan. Few months back when they had a similar promotion, they said that I had to switch to the One plan. It might be worth switching however. The TMobile one plan additional line fee drops off considerably after 3 phones. I found I payed about the same as the 5gig plan I had before it. Adding a new line is deal breaker for me. Come on Tmobile. We are locked up 2 or 3 years for your business to get a bill credit and just it is NOT right to force your SIMPLE CHOICE customers want to take advantage this promotions by adding a new line that I DONT NEED. Tmobile needs to find other ways to offer phone promotions to people who are already with them and don’t need another line. Trading in is fine, but the new line requirement is really getting old. Please stop making it so complicated just to get a deal, tmobile. You’re better than this. My mom really would like a new phone, but I have 9 lines. I’m not adding another line just to get a discount. On the outside you speak a good game, but with all the requirements you end up playing people just like the others. Adding a line ends up erasing the whole point of a discount. They’ll take your phone on trade and finance your new one for free. What entitles you to more? It isn’t about entitlements. It’s about taxing current customers. It’s forcing customers to pay to get a deal. Even if they can justify having a new line, if they didn’t need the extra line they are being forced to pay to get a deal. If this was aimed at new customers, that’s fine. However, they aim these at everybody, so they know what they are doing. With the add a line, it’s $20/month extra (more if you only have 2-3 lines). If you need a line, that’s fine. However, most don’t. So to get the deal, you’re paying $20 more a month for whatever you get. That’s $240 a year EXTRA. That isn’t a free phone anymore (you have to pay taxes anyway, so it’s never really free). From previous deals, I’m pretty sure you can’t cancel a previous line to get this, and you can’t cancel after the fact or the full cost of the phone is due(though you still get the credits to make up later, but that defeats the point of “free with bill credits”). Verizon has the same kind of deals going, so it isn’t just T-mobile. But Verizon does have some other offers that, although not as good of a discount, still offer some discount for just getting a new phone on EIP. T-mobile doesn’t have any offer like this. They are supposed to NOT be like the rest. Offer a simple $100-200 discount for a new phone on EIP. It isn’t that hard. You lock people into a new EIP (not much different than a contract), and you make customers happy. Offering deeper discounts with more requirements only makes people more disgruntled. No, it’s not a tax. If you don’t need a new line the promotion isn’t for you. Buy a phone if you need it. This isn’t much different than the cable company offering you $200 to switch your home internet. Do you think they should give you the same $200 every year just because? Of course not, that’s silly. The incentive is to get your business from the competition. I agree if this was one of their deals, but these are their only deals. It didn’t used to be this way. And Verizon offers some deals without a new line. Most are the same, but at least they offer something. Back in the 2 year contract days at least you could upgrade on a deal without adding a line. This isn’t to pull people from other carriers. They have special deals just for that. This is meant for everybody. You guys can’t compare this to one time up front deals. I got a free Samsung phone a few years back – it was worth about $120 at the time. Friend with the 10gig plan got a $250 Samsung J7. so why do verizon and at&t give better black friday deals for existing customers? On top of that, you can also buy their devices through target or best buy with their own unique promotions ….. why customers on tmobile cant do that? The great part of having choices… you’re welcome to switch to AT&T or Verizon if you’re unhappy. If people actually understood how a business works or how carriers make money they wouldn’t be complaining here… T-Mobile is invoiced for almost the entire cost of the phone from the manufacturer. T-Mobile makes ~$0.50 on every iPhone sell and android phones have a little more room to bargain as they make ~$20 per sell. If T-Mobile is going to flip the bill for you they have to make up for it somehow and an add a line does that for T-Mobile. There’s way more room to negotiate on Accessories and Service deals… That’s why you are seeing good discounts on Accessories here because they can cut cost and not lose their butts. They also have a BOGO line offer going right now. This is why people who work for T-Mobile DON’T GET FREE PHONES. They receive discounts on service and accessories. EXACTLY. They take a loss financing phones at 0% too. T-Mobile owes you nothing. They lose a little on each one but make it up in volume. LOL. Luckily the last I heard is it costs roughly $6 per sub to provide service every month and average revenue per sub is $46. T-Mobile is not paying any where near full cost for these phones. I’m not sure where you got your information from, but it’s not accurate. That’s not how retail works. How would the retailer make money if there isn’t a mark up on price. You got places like Walmart and Amazon selling the same phones as T-Mobile at full cost, but they aren’t selling you any cell phone service. Going by your explanation they’re not making any money off the phone. Having worked for T-Mobile (this is why I know) when you do inventory weekly when you are +/- a device or accessories it gives you the invoiced price on a report you print. T-Mobile stores are closely monitored for their “shrink” and this affects the stores total revenue, which for higher volume stores managers are payed a percentage of as a bonus. If Apple is so cheap as to not include a headphone adapter in the new iPhones what makes you think they wouldn’t be cheap with cell phone companies? Why do you think it took so long for the iPhone to be picked up by T-Mobile when the other 3 carriers had it for several years? Why would Apple be the first trillion dollar company if they didn’t pinch pennies? So T-Mobile is selling the LG G7 for $600 and Amazon is also selling the same LG G7 for $600. With your analogy T-Mobile makes about $20 off the phone and money off the service. How is Amazon making money off the phone if LG is selling these phones to retailers at full cost? It wouldn’t make sense for retailers to buy and sell these phones for such little profit. and this exact commend is why I’m done arguing with you because you don’t know how things work. Amazon owns a very small percentage of the products they sell. Most of the items merchants ship to amazon and use the FBA program so that amazon stores the product, handles shipping, payment processing, and returns. Even if Amazon did own this inventory of G7’s Amazon wouldn’t care about making money off of the revenue of the phones. Amazon makes a killing off of AWS, Subscriptions, and Seller Fees. There are several sets of books and valuations for products. This guy probably had no idea what he was looking at. I believe many Tmo stores are privately owned as well – how do they make money? Is it all from the $25 SIM cards? How can the stores even afford employees? T-Mobile store owners do not make any profit for selling phones. All profit are from new activation/ features and accessories. Yes, they get paid on activations and make money from accessories which have HUGE markups. The phones themselves not so much. MetroPCS stores make money for accepting payments too. The re-sellers have it even worse. They lose money on most phones. Every dollar they make is on activations and accessories. People ask why accessories are 3 times the price in a store as opposed to online…it’s because it’s one of the few ways these retailers can make money. Actually you just pointed out the best proof of all. The fact that everyone sells for the same price shows you there’s no profit. If there was a big markup to play with then someone could sell for less right? That’s why you never see big differences. Amazon doesn’t finance that $600 phone and it doesn’t cost close to $20 to inventory. I believe it’s time for you to take some ECON classes. While they may not make that much up front on phones, there are other ways big retailers like Tmobile make money on hardware sales. In the retail industry, there are a lot of forms of profit building. For instance, car dealers are given big bonuses for the volume of cars they sell, so thats why some are willing to make nearly no profit off one car because if they can move 20, they get far more in a bonus from the manufacturer than if they only sold a few with a good markup. I wouldn’t be surprised if phone companies give kickbacks for high volume, etc. Just because you don’t see a high margin on the warehouse order form doesn’t mean the people in the office are not working things on the other end. T-mobile is making money on all sides. They wouldn’t be offering their own budget phone if phones didn’t make them money. I think that’s the point. Phones aren’t a profit item they’re a loss leader. The profit is always in the subscription. Sort of like printers and ink cartridges? That’s a common misconception. T-Mobile pays right around what they sell them for. It’s not nearly as bad as the old contract days where they’d give a phone that cost them $200 away for free, but phones are absolutely NOT a profit center and they indeed lose money on every single promotion and on every single finance plan. agree! i work for tmobile and you are accurate on what you are saying . now reps don’t even make money on the phone when customers activate a new line and buy a phone. There are definitely people who work for T-Mobile who get free phones. I think what you meant is retail employees? Tmobile employees don’t get a free phone, at any level in the company. A few of them are beta testers for future devices but they are short term loaners. It offers its employees 75% off Tmobile ONE and 20% of accessories, but not a cent off any device. John is not “management”, he’s the CEO…who knows what the rules are for the handful of C-level execs but it has no relationship to the cost of the device. I worked in management at T-Mobile for several years and no-one is getting free phones. Even those taking home several hundred K a year are buying their own phones. He’s also not the only one one who gets free phones. Do you think Mike doesn’t? Neville? How far down do you think you have to go before people start having to pay… regional? The point that someone made was that retail margin on devices is slim. As evidence they offered that tmobile employees don’t get a discount on handsets. This is all true. Whether a small number of the most senior execs get free devices is irrelevant to this point. I agree that retail margins are slim, but for you to say “employees at any level don’t get free phones” is wrong. Of course support and front line aren’t included those are low level jobs, but trust me that reps and management don’t get sent out with old tech that doesn’t even support their newest bands. Guess what? They’re provided laptops too! I’d rather have a deal of four lines of unlimited for $100. Or even bring back two lines for $100. For people that don’t need or want to add a line just be patient and wait about 6 months. These phones will be $300 or less outright. Yeah because there will be new ones that will be way better. Now is really a bad time to buy a phone. Wait for 5G. @ Nardva. Will be we able to to keep the promotions after disconnecting the line after 6 months. Old customers can also add a line and get this promo. Don’t appreciate customers? T mobile Tuesdays? I consider TMO Tuesdays a gimmick. Call it what you will, but free stuff is still free stuff… that you don’t get with ANY other carrier! A free cup of coffee every couple of weeks isn’t a gimmick for me. It is, but it’s good none the less. They should have a discount based on the number of years you have been a loyal customer. Say $50 per year and capped at 50% of the value of the phone you want to buy. Limited to one phone per year. All on black Friday. And no requirement for an additional line. I’d say $100, especially since you got phone over $1000 now. *YOU* are the fool giving Apple/Samsung $1000 for a phone that you absolutely 100% do not need over a 6s or A6. T-Mobile need not sponsor your frivolity. Andrew, who are you to say that I absolutely 100% do need S9+ over an A6 for my digital photography needs? That’s exactly why they got rid of kickback and also got rid of the prepaid cards. People were paying $30 for three months, getting their Visa, then cancelled the new line. Are you kidding? Old customers get the best rates! they used to have 2 lines for $100. I’m too old to join the military, and unless I have my parents sign up, I’m not doing it. A XR for $200 is a very good deal if you plan on keeping the service. $480 for 2 years a service doesnt sound bad at all either. I need a new line and this came right on time. XR credits are for three years I found out so add another $240 to that number. If you need a new line and plan on staying for a minimum of three years then I guess it’s a deal. Don’t forget you have to trade in a phone too. Is T mobile still running the BOGO line offer? How can you add a line and trade in a phone? Wouldn’t that mean that you would have to have a extra phone that you’re not using that also have be eligible trade in for this offer. Yeah, I was thinking the same thing. How can your one new phone have two lines? Note a ripoff if you are adding a line anyways and have a old iPhone 6s or 7. Am I missing something? I have to give up my phone AND ADD A LINE just get a new phone that can only have one line? What? Why not just take 50% off a new phone? It’s not like you can’t take away the discount afterwards. They’re not gunning for you to add a ghost line. It’s for expanding your account with another person. I don’t get it, you get $250-350 for the trade in and then what? They give you an additional $400 for adding a line? Making it $750 over 2 years, is that right? If someone actaully wanted to add a line, the Costco deal is far better correct? Looks like you get the full rebate card in a lump sum instead of spread over 3 years. I’d imagine you can then cancel the line in a few months too if you wanted. This is definitely better. Did the same thing when Costco had the $500 off Note 9 pre-order promo. Looking to get the XS Max for the wife using this $750 off promo. Now if i can only use the $450 giftcard Costco gave me from the Note 9 promo. I’ll be golden if possible. Is it possible to cancel the 2nd line after 2-3 months if we go with this Costco deal ? I still think its hilarious when people get mad about a deal that doesn’t benefit them but could benefit other people.. Scenario: At the grocery store and want to buy cheerios… oh man fruit loops are on sale but not cheerios.. I want cheerios!!! why doesn’t Costco have a sale on cheerios?! Thats what I want!!!! you have to understand that the offer is to attract new customers and not for existing customers who do not need a new line, if they wanted to have old customers happy they would give them a a percent discount to buy a new phone, but no. How does adding a line for a minimum cost of 480. (20/month at 24 Months) and trading in a phone that you could probably get at MINIMUM 200 for selling on Swappa, constitute being called “FREE”.? I love T-mobile, but this is the worst of all of the carriers. Here’s what you’re getting: $750 credit. Here’s what you must do: If you’re an old customer, your additional line would probably cost around $10 a month. Calculate that by 24 months is $240. If you’re a new customer, your new line is gonna be around $20 a month, 24 months is 480. So by paying $240 or $480 you’re getting a whopping $750 credit correct? Benefit. Sure you need to trade in a phone as well. The trade in phone models are broad and if you feel like you can sell your phone for higher on Craiglist then suit yourself. You can literally buy an Iphone 6s on Amazon right now for $150 to use for trade in. Even with an additional $150 plus the $120 or $240 line, you’re still getting $750. Man, imagine you’re a NEW customer coming in to switch over with an old Iphone 6s, you’re already able to switch to a newer model phone for free. Again, benefit. Yes, you do not NEED. You do not USE. But it is still benefit correct? Always with the snobby customers claiming T-mobile does not appreciate old customers. You can literally add a line for only $10 if you’re an older customer. $10 x 24 month will only cost you $240, where you’re getting a $750 credit back for purchasing a new phone. You don’t even have to use the new line. Newer customers have to add a line for $20 a month, which is $480. So yes, as an “older” customer, you are getting a deal compared to new customers. Not very bad for $510 off yes?